Shares in Nokia plunged 17% after the mobile phone giant surprised investors by saying it expected to make losses in the first half of 2012. The Finnish company said competition in the industry had led to lower sales particularly in India, the Middle East, Africa and China. Nokia had previously expected to break even in the first quarter. 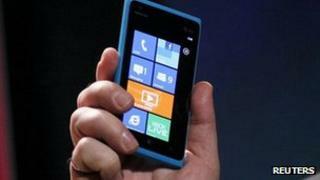 It said it would continue to increase its focus on accelerating sales of its Lumia smartphones and cutting costs. The statement, issued in the middle of the day, surprised the markets and prompted an immediate sell-off of Nokia shares, pushing their value down to their lowest level since the late 1990s. "It's a disaster," said Thomas Langer, an analyst at West LB. Nokia said : "During the first quarter [of] 2012, multiple factors negatively affected Nokia's Devices & Services business to a greater extent than previously expected." As a result it now expects operating margin in the first quarter 2012 of "approximately negative 3%", compared with the previously expected range of "around breakeven, ranging either above or below by approximately 2 percentage points". It expects operating margin in the second quarter "to be similar to or below the first quarter 2012 level". Last year, Nokia announced a strategic partnership with Microsoft that would see it move away from its Symbian operating system on its smartphones in favour of the Windows operating system. "Shipments of Symbian devices are declining faster than we anticipated," Mr Langer added. "I think that was maybe the single most important risk with regard to the Nokia model: that the ramp up of Lumia devices is not fast enough to compensate for the shortfall in Symbian shipments." Nokia chief executive Stephen Elop said the business was in transition after a difficult first quarter. Its Lumia 900 smartphone, which uses the Windows software, went on sale in the US on Sunday. "We have established early momentum with Lumia, and we are increasing our investments in Lumia to achieve market success," Mr Elop said. Also on Wednesday, Nokia revealed a new version of the Lumia 610 with near field communication (NFC) technology, which allows users with similar technology to exchange data on their handsets and make payments. Ben Wood from CCS Insight said the first half of the year was always going to be challenging for the company. "Nokia's challenges have been exacerbated by rampant competition - notably from Apple and Samsung who are extracting a disproportionate amount of margin from the industry at present," he said. In February, Nokia announced the details of 4,000 job cuts, two weeks after posting a 1.08bn euro ($1.4bn; £905m) loss for the three months to the end of December 2011. The company announced earlier that a software bug in the latest Nokia smartphone had caused some handsets in the US to occasionally lose their data connection. The Finnish manufacturer offered customers $100 (£63) in call credits and said a fix for the Lumia 900's "memory management issue" would be issued on 16 April.